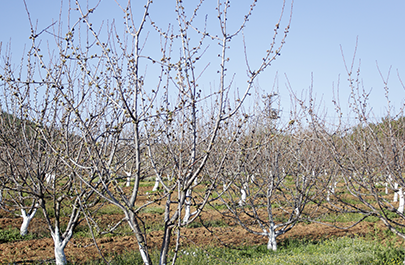 Commercial cherry cultivation has changed dramatically since the 1970s, as it has for most fruit trees. In contrast to the large-canopy, high-stemmed labour intensive trees that were dominant until then, commercial cultivation today uses only the low-stemmed form. Thus,10 to 20 times more trees can be grown in the same area. Their height is limited so that all work can be done by hand without a ladder. Cherries for the processing industry are often harvested mechanically. Sweet cherries have similar location requirements to apple trees. They grow well on nutrient-rich, well drained, and moist (but not waterlogged) soils. Areas with late frosts must be avoided because of the risks associated with early flowering. 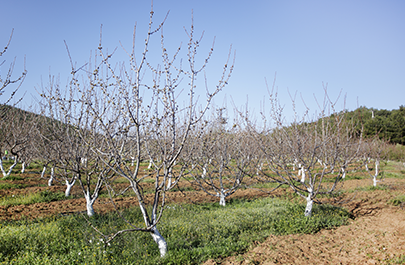 In areas with high precipitation, a polythene cover is recommended due to the high risk of fruit bursting. Most varieties are self-infertile and need pollinators. They are usually harvested mechanically. Sour cherries have less stringent location requirements compared to sweet cherries. However, cold and impermeable soil can cause premature fruit fall. The risk of bursting is reduced, making them also suitable for areas with plenty of summer precipitation. Sour cherries are usually self-pollinating. Since sour cherry trees are mainly grown for processing, they are usually harvested mechanically. An adequate supply of calcium (Ca) is hugely important for the production of high-quality cherries. Although only about 4 kg/ha of Ca is stored in the pulp, even minor Ca deficiencies lead to unstable cell walls and physiological disorders. Basal fertilization with P, K, Mg, Ca and B is best done during the dormancy period (November - April), on snow free, not frozen or heavily soaked soil. Organic material is also applied, preferably at the beginning of the season (March - April). Fertilization is based on the nutrient quantities extracted. Cherries, and sweet cherries especially, are classified as being highly sensitive to chloride; fertilization is best achieved using potash-heavy NPK fertilizers based on potassium sulphate. The table shows uptake and absorption per tonne of cherry yield. According to this, cherry trees need mainly nitrogen, potash and calcium. For example, a cherry yield of 20t/ha takes up 140kg N/ha. If 30kg N/ha is supplied from the soil (e.g. ), 110kg N/ha would need to be fertilized. The yields export 38kg N/ha. Granulated fertilizers are applied with the fertilizer spreader. The big advantage of this application technique is high performance per hectare and the technology is widely available. Best suited for N fertilization in liquid form. The liquid fertilizer is dissolved in a tank and can be applied alongside herbicide using a targeted boom sprayer. The nutrients are more targeted to the plants when applied in this way. Fertigation is the addition of fertilizer to the irrigation water with suitable equipment. Fertigation has the advantage that the nutrients are applied continuously and in a targeted manner. 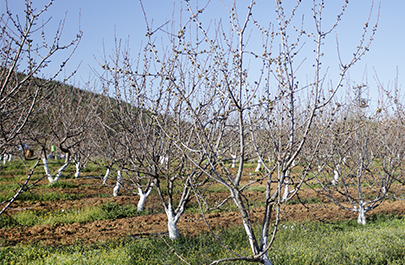 The increased use of drip irrigation systems in orchards has also increased the importance of fertigation. Foliar applications are suitable to compensate for deficiencies as quickly as possible. The roots cannot absorb all the required nutrients in the desired ratio (under special soil or weather conditions). At this time, one or more applications with foliar fertilizers make sense. Nutrients that miss the leaf can also be taken up from the soil. Nitrogen fertilization is carried out in two to three doses after the start of the growth period, shortly before flowering until the end of June. The trees absorb the nitrogen mainly as nitrate. Nitrate (anion) can promote the uptake of cations such as calcium (Ca2+), magnesium (Mg2+) and potassium (K+). N-doses can be applied specifically to the tree rows and only occasionally in the tramlines. Growing grass between rows reduces the risk of nutrient leaching. If the N fertilizer is concentrated at the tree rows only, the concentration (N per area) should not exceed twice the concentration, which would be used at the total area. The total amount can be concentrated on the row if used together with P, K, and Mg. N can be applied very efficiently in liquid form (herbicide boom sprayer or via irrigation). Young trees are fertilized according to their stage of development. Calcium is important for cell wall strength and supports stability and shelf life. Ca applications can reduce the bursting of the fruits. For reasons of better tolerance, two to three foliar applications of Ca to the juvenile fruits are recommended in addition to the basal fertilization. Depending on growth and yield, the annual absorbtion of cherry trees amounts to approx. 30kg MgO/ha. The leaves take up the major part, but remain largely in the nutrient cycle. A favourable form of magnesium soil fertilization consists in the use of Mg-containing limestone in the course of a preservation liming.